I'm always experimenting with new ideas so that food doesn't become boring...and here's a joyous idea, very low fat and extremely pretty. 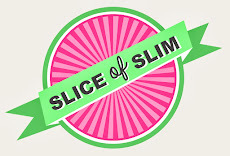 Slice-of-Slim is all about retaining the excitement of food, even if you are trying to lose or maintain your weight. The vast majority of my recipes are quick and easy...but sometimes we might just want to put in a little extra creativity for a special occasion. These 'frillies' are simple to make, but take time as they have to be made in batches. I think they are well worth the effort. I've made a variety of vegetable 'frillies' out of potato, sweet potato, turnip and beetroot, all of which were really successful. The apple and pear fruit 'frillies' make an exquisite dessert.....like something from a French patisserie without the pastry! They all use the same technique which uses a mandolin slicer (see post; USEFUL STUFF:Mandolin Slicer), but vary slightly in propoints and calories, depending on the vegetables or fruits used, so I'll talk you through each variety. This amount works out to 7pp/approx.200kcal for the WHOLE lot. Leave the potatoes unpeeled. This adds to the finished effect. Start by slicing the potato and sweet potato on the mandolin. Weigh the slices until you have 100g of each of the varieties. (100g is about half an average medium potato). Place some greaseproof paper on a baking tray and spray with Frylight oil. Arrange the slices of potato evenly across the paper and spray the slices with more Frylight oil. Although I don't use salt in my recipes as a rule, these benefit from a tiny amount of garlic salt sprinkled on just before baking. This just enhances the flavour. Bake for about 10 minutes until golden and crisp on the edges and slightly soft in the middle. Keep an eye on them as they can burn very easily. The edges will curl up - this adds to the finished 'frilliness'. You can serve them immediately by layering them with extra light Philadelphia as shown below, or allow to cool before layering them up if you want to prepare them in advance. You can pop them back in the fridge to store, then into a hot oven for 2-3 minutes just before serving. This makes sure that the cream cheese stays solid, acts like a bonding material and won't melt everywhere when you reheat them quickly. To build the 'frilly', simply put a small blob of extra light Philadelphia on each slice as you build. Layer them up alternately-sweet potato followed by potato until you have 4 separate stacks. Use half a mini pot of philadelphia per stack. The potato 'frillies' make a beautiful accompaniment to roast beef, chicken or grilled fish. They are a great alternative to roast potatoes as they have the crunch and softness but much less fat. Serve with some simple vegetables. Sometimes, something as simple as a decorative plate can provide inspiration for a dish. With the 3-D food and leaves on it, it reminds me of an Old Masters painting, or botanical illustration. These follow exactly the same instructions as the potato version. The only thing I did differently was that I stained the edges of some of the turnip slices by rubbing cut beetroot on them. This made an 'ombre' effect and the finished result looked like a blooming flower. (Above, right). Look how beautiful and ribbon-like the purple skin of the turnip looks on the finished 'frilly'. (Above, left). The picture above shows the ombre effect, before baking. These vegetables are all 0pp so you only need to charge for the extra light Philadelphia. One mini pot is 1pp/38 kcal. The fruit 'frillies' are absolutely exquisite. As I said before, they look like something you would see in the window of a Parisian patisserie! Before baking, sprinkle with some artificial granular sweetener and cinnamon. Place a few whole basil leaves on the baking tray with the apple or pear. Layer up the slices with chocolate Philadelphia. Half a mini pot is enough, so this whole apple is only 1pp/approx.100kcal! Finally, top with a baked basil leaf and sift a tiny amount of icing sugar on the top. This is beautiful served with warm black cherries and frozen vanilla yoghurt. Use exactly the same technique for the pear. Try to leave the top of the pear and the stalk intact when baking as it looks really effective when 'rebuilt' to serve. The pear is also only 1pp/approx.110kcal. If you don't like chocolate Philadelphia, add some cinnamon and a little sweetener to the normal extra light Philadelphia. This works equally well and is even less propoints/calories. Just like the vegetable 'frillies', these can be made in advance, refrigerated and popped into a hot oven for 2-3 minutes just before serving, to warm through. Beautiful, balletic and almost too good to eat! Can I come and live at your house? Janey, I adore this beautiful and healthy food art!! You are so amazing!! Thank you for sharing on Fit and Fabulous Fridays!